Cookies are small text files which web servers can place on your computer when you visit their website. Cookies are typically used to help websites remember that you've logged in, or perhaps to store your personal preferences for that website. Cookies can also be used to track your behaviour (and particularly to track your behaviour across a number of different websites). Third-party cookies are often used to do this, and a lot of web users choose to disable third party cookies to help prevent them being tracked. To find out if your browser is allowing Third-Party cookies, Visit our third-party cookies detection page. You need to make your own decision about what kinds of Cookies you want to allow. A lot of websites require that Cookies are enabled for their functionality to work. Here are a series of guides to help you configure your settings regarding Cookies. Referring to Apple's Help Documentation on the matter seems to indicate that the "Allow from Current Website Only" choice means strictly that only the website you are viewing is allowed to set cookies on your iPad. Congratulations, you just configured Cookies in Safari on iPad. The screenshots below are taken from Mac OS X, but the process is the same on Windows. As you type in "Cookies" (it's not case sensitive) you will see Chrome start to change what's shown on the settings page. It will reveal the "Privacy" section and highlight two buttons with two yellow "Cookies" callouts. You are then taken directly to the Cookies setting. You can now change your Cookies setting to what you prefer. Typically (especially if you are already following this guide!) you want to enable cookies in Chrome by selecting the first option - "Allow local data to be set (recommended)". This will allow websites to store cookies (and other data!) on your computer for as long as the websites want to. An alternative to this setting is to choose "Keep local data only until you quit your browser". This will allow normal cookie functionality (eg. logging into websites with a username and password), however every time you close and reopen your web browser, you would need to log in to the website again. This setting can also help (but not necessarily eliminate) advertising companies tracking your behaviour across various browsing sessions. 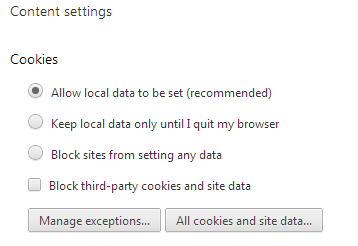 And of course, if you want to disable Cookies altogether, choose the "Block sites from setting any data" option. One other option to consider is to "Block third-party cookies and site data". This means (basically) that any website you directly visit is allowed to store cookies on your computer, but any "third-party" website (eg the server that places advertising banners on the site) is not allowed to place a cookie to track you. Note that this will not stop the advertising appearing, just (hopefully) decrease the amount of tracking they perform. Congratulations, you just configured Cookies in Internet Explorer. In both Windows and OS X, the menu button will be in the top right-hand corner of Firefox. If you're using Mac OS X, it will be called Preferences. If you are using Windows, it will be called Options. Use custom setting for history will allow you more fine-grained control about what Firefox allows and remembers. You now have the choice of enabling or disabling certain history features, including form history, browser history and most relevant: whether or not to Accept cookies from sites. You can also configure how long Firefox will keep the cookies it sets. Congratulations, you just configured Cookies in Firefox. This guide will step you through the process of configuring Cookies in Safari. 1. Click the "Safari" menu, choose "Preferences"
The contents of the Privacy tab screen will now appear. On the Privacy Preferences tab, you will see the "Block cookies and other website data: choices. If you select "Never block cookies", you will get the most permissive Cookies policy - all Cookies will be allowed, including third-party cookies from advertisers and web-trackers. If you select "Always block cookies", Safari won't allow any cookies to be stored, however you will probably encounter problems with some websites; for example being unable to log in. If you select "block From third parties and advertisers", you will get standard cookie functionality while preventing "third party" servers (eg the type that place Advertising banners) from setting cookies. Congratulations, you just configured Cookies in Safari. After extensive testing and debugging, it seems that when you disable Third-Party cookies in Safari, it will still hold on to them and keep using them until you restart Safari (or perhaps even Reset Safari). So if you choose to disable third-party cookies in Safari, make sure you restart (and preferably Reset Safari) to ensure that it doesn't keep using any third party cookies it may have cached. This guide will step you through the process of configuring your Cookies settings in Safari on an iPhone or iPod. 4. Go to the "Privacy & Security" section. Tap "Block Cookies"
Referring to Apple's Help Documentation on the matter seems to indicate that the "Allow from Current Website Only" choice means strictly that only the website you are viewing is allowed to set cookies on your iPhone. Congratulations, you just configured Cookies in Safari on iPhone. 0 Response to "How To Enable Cookies"